Fascinating marine animals await you at the end of a mere half-hour drive out of Waikiki. Follow Kalaniana‘ole Highway east and up the Makapu‘u coastline—one of the most scenic drives on the island—to arrive at SEA LIFE PARK, situated directly across from Makapu‘u Beach and “Rabbit Island.” This East O‘ahu attraction is a place to enjoy the company of dolphins, monk seals, sea lions, rays, sharks, native fish and more! With a focus on educational and INTERACTIVE PROGRAMS, Sea Life Park is small enough to enjoy on foot, but diverse enough to be a full-day destination. SHOWS and talk sessions with trainers, held throughout the park, are included with the price of admission, as are HANDS-ON EXHIBITS, like the TOUCH POOL and HALE MANU BIRD AVIARY. Sea Life Park also offers a set of three-package deals, which includes a combined entrance fee for Sea Life Park, a Pearl Harbor tour and a Diamond Head State Monument tour for a discounted price. 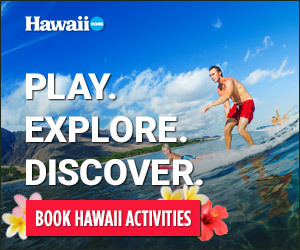 Visit sealifeparkhawaii.com/pacifichistoricparks for more info. A “hidden gem” of the park is THE HAWAIIAN RAY ENCOUNTER, which allows you to touch the silky-soft wings of giant, gentle stingrays, feed tropical fish and share the water with a gorgeous juvenile reef shark. And if you dare, take a trek down into the 300,000-gallon tank with full-grown hammerhead and reef sharks. also home to the TripAdvisor.com’s No. 1-rated lu‘au on the island: CHIEF’S LUAU. So, for one drive out to Makapu‘u, you get to experience a full day of fun and sun and one of the best-reviewed dinner shows on O‘ahu. Touch, feed and swim with DOLPHINS just minutes from Waikiki at DOLPHIN QUEST OAHU. Located at the luxurious Kahala Hotel & Resort, Dolphin Quest offers guests the unforgettable opportunity to meet dolphins up close in a large, ocean water lagoon. Visitors can watch or participate in these inspiring and educational dolphin encounters for both the young and the young at heart. WAIKIKI AQUARIUM also features multiple keiki (children) activities that bring young ones face to face with marine life like living reefs, algae, starfish and more. Best to check with its website (waikikiaquarium.org) to see a calendar of events. On O‘ahu’s Wai‘anae coastline, there are a number of charter boat companies that offer guests the opportunity to swim in the open ocean, often alongside wild dolphins (but no guarantees!). These inherently curious creatures often will join swimmers rather close to shore, and frolic alongside people who swim. However, it is integral that guests respect the dolphins’ wild nature and not attempt to feed, pet or directly approach them.